St Grwst’s Church is changing. Our Heritage Lottery Fund project will transform the church and its role in the local community. It will repair and preserve our medieval church and chapel for future generations , create a vibrant community hub and share our rich heritage with a wide audience. As you stand in the church, in such an idyllic and peaceful setting, it can be difficult to imagine that Llanrwst has been at the centre of many battles over the centuries. In fact, many parts of the town have been devastated and re-built twice, and the old church that stood here suffered on both occasions. The old church on this site was partly destroyed by fire when Llanrwst supported Owain Glyndwr's uprising against English rule in the 15th century. Apparently the town was deserted for so long after the battle, that grass grew on the square and the deer from the forest came to graze on it! After this battle, the town didn't have much time to recover, because around 60 years later Llanrwst was involved in the 'Wars of the Roses' - the Yorkists versus the Lancastrians battling for the throne of England. This time in 1468, the old church was burnt to the ground when the Earl of Pembroke's men (Yorkists) retaliated against Llanrwst (Lancastrians) for the burning of Denbigh. The man who led the battle in Llanrwst was Dafydd ap Seincyn (known as the Welsh Robin Hood), and his spur can e seen in Gwydir Chapel, next to the church. It was these events that laid the foundations for the Tudor reign in Britain, when the Crown was seized by a fellow Welsh Lancastrian, Henry VII. The current Church building is around 600 years old and was built in 1470. It is dedicated to St Grwst, a Celtic Saint who founded a church in Llanrwst in the 6th century. That original church was on a site near here, called 'Cae Llan' (Church Field). The land on which this church is built was donated in the 11th century by Rhun, son of Nefydd Hardd who was the founder of one of the fifteen great families of Gwynedd. Rhun gave the land to build the church to make amends for the actions of his father, who had murdered Prince Idwal, the son of Owain Gwynedd (King of Gwynedd). Unfortunately, the church that was built at that time was destroyed during the 'Wars of the Roses'. 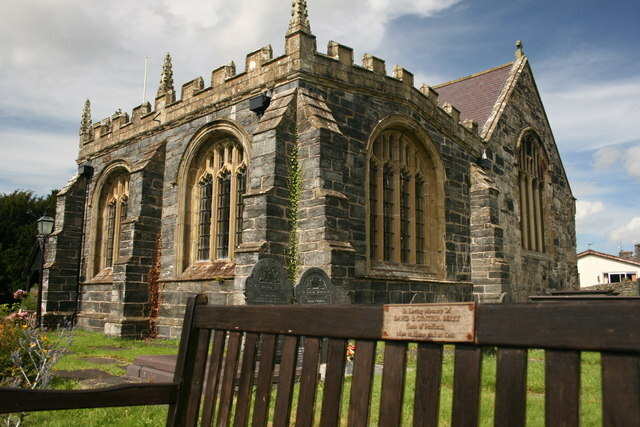 More history about St Grwst's Church and Llanrwst can be found at History Points .